Matt is the Head of Marketing at Powder Byrne and has 2 young daughters (Dolly 2 and Martha 6 months) and is looking forward to a relaxing summer holiday with his wife, while their girls enjoy all the fun of the PB crèche. We all look forward to a relaxing and well-earned summer holiday. Lounging by the pool, reading a few good books, exploring local beaches and sipping sundowner cocktails. Summer holiday bliss. Unfortunately, these are all things you do not get to enjoy when travelling with very young children. Suitcases full of nappies and formula, travel cots and prams, broken routines and broken nights sleep. This is the reality of a summer holiday with our young daughters. It's almost enough to make you stay at home, draw the curtains and settle in for a 2 week long Peppa Pig marathon. Fortunately for stressed-out parents like me, the PB crèche programme has been designed and developed over 30 years to save young families from such holiday woes. For Powder Byrne clients the PB crèche care and service start as soon as you confirm your booking. Your travel consultant will take full and complete details about everything we need to know about your young child to ensure that we can create the best and most enjoyable environment for them out in your chosen resort. Meal times, dietary requirements, favourite foods, favourite toys, important routines - are just some of the details that we will collect in advance for our crèche teams. This can all be handled at the time of booking via your travel consultant, or at a later date via our Client Concierge team. We also offer a very handy and flexible pre-travel in-resort purchase service for all of those baby essentials. Forget about that extra suitcase of nappies, wipes, formula, travel cot, etc… and let the Powder Byrne team take care of that for you and have it all waiting for you on your arrival. Shortly before your holiday, we will arrange for our PB crèche manager to call and run through our pre-travel questionnaire, answer any questions you may have and take note of any additional important details that our PB crèche teams need to know about your little ones. All of our crèche managers are all fully qualified (NNEB/CACHE or equivalent) and experienced nursery nurses. 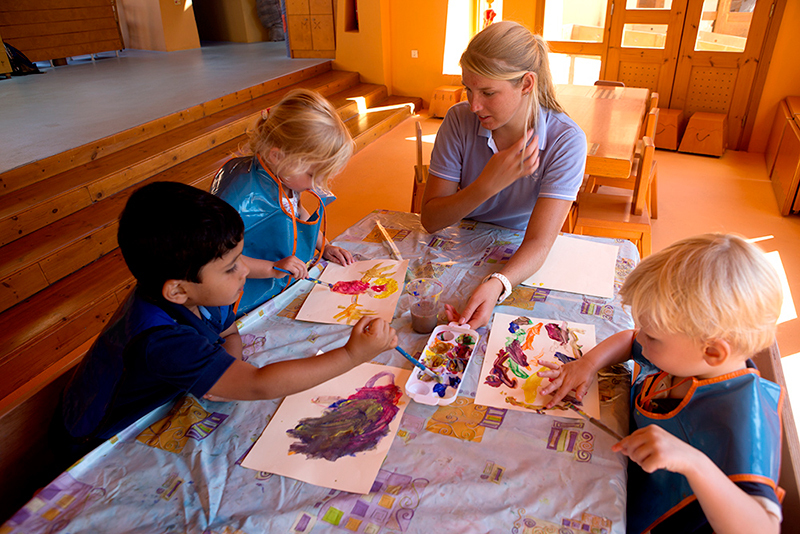 The daily crèche activity programmes vary by age group (babies 4-18 months and toddlers 18 months-3 years) to ensure that all children in the crèche are engaged with enjoyable, educational and age-appropriate activities. Outdoors they will enjoy splashing in the pool, building sandcastles, collecting shells, nature walks and other adventures around the resort. Inside they will be entertained with a variety of arts and crafts, sing-a-long and story times and of course some all-important downtime. We all know that babies and toddlers can be grouchy if they don’t have their afternoon siesta! Meal times are healthy and nutritious and of course, any special arrangements or dietary requirements are catered for. Now with the children happy as sandbags in the PB crèche, it’s time for the adults to relax and enjoy all of the treats and delights of your chosen resort. The Powder Byrne resort team will be on hand to help make your holiday as smooth as possible, as well as recommending and booking a wide range of activities, excursions and restaurants. For those feeling active, you can try your hand at a range of different sports and activities, from tennis and cycling to scuba diving and sailing. For those feeling indulgent, you can treat yourself to luxury spa treatments, calming yoga sessions and peaceful walks on the beach. I am looking forward to exploring Crete with a few afternoons of guided cycling and getting stuck into the latest Jack Reacher novel (guilty pleasure), while my wife is dreaming about a daily massage. The PB crèche runs 6 days a week from 10am-4pm and can be booked on a per week or per day basis depending on how much rest and recuperation you parents need - we’re opting for the 6-day option! Happy kids, happy parents, happy holidays!! To find out more, call 020 8246 5300 to speak to one of our knowledgeable Travel Consultants or click here. Our summer testimonials from just a few of the many happy families that have travelled with us last summer.